We learned a lot in the first year of Statcast™, simply by being able to put measurements to things we could always see with the naked eye, like throwing-arm power and foot speed. But perhaps nothing ended up being more interesting than spin rate, simply because it's not something you can see, and it was never something that could be reliably measured by the public. But what's the relationship between spin and velocity for individual pitch types? Does velocity correlate to spin? What's the average spin rate and velocity for each pitch type? What do these pitches look like? With a full season of data in the books, we can begin to answer those questions. In 2015, there were 1,679 examples of pitches thrown at least 100 times. Due to small samples, we excluded forkballs, knuckleballs and screwballs from this experiment, and due to knuckleballers being from another planet, we excluded R.A. Dickey and Steven Wright entirely. At first glance, this is a big mess of colors and data points, so we'll go through pitch-type-by-pitch-type to make it clearer, but even in this view, you can find something useful. At lower speeds (left side of the chart), spin rates can vary wildly. At higher speeds (right side), spin rates exist in a tighter band between about 1,800 and 2,500 rpm. Even that simple piece of knowledge is new to us. We're living in the future. With the 40-year-old Betancourt's playing days looking finished, the reigning active four-seam spin king would be Dodgers reliever Yimi Garcia, at 2,533 rpm. Garcia had the third-lowest ground-ball rate of the 328 pitchers who threw at least 50 innings, but had a higher strikeout rate than Stephen Strasburg or Jose Fernandez. Most fastballs are thrown between 90-97 mph, and unsurprisingly, Chapman blows away just about every speed mark in recorded history -- more than 54 percent of triple-digit pitches thrown since 2011 have been by him. If Buerhle, currently unsigned, doesn't return in 2016, then Joe Thatcher (84.3 mph) and Jered Weaver (85.0 mph) would have baseball's slowest non-knuckler fastballs. For our purposes, two-seam fastballs and sinkers are grouped together. Two-seamers tend to have somewhat less spin and velocity than four-seamers, because they're intended less to miss bats and more to induce grounders -- hence the "sinker" terminology. We talked about Richards a lot this year as the king of high spin. Unfortunately for him, high spin isn't really what you want from a sinker, as it got the lowest whiff rate and lowest grounder rate of any of his four pitches. Peralta's 12.6-percent strikeout rate was the fourth lowest of 141 pitchers with 100 innings; the second-lowest spin pitcher, Brett Anderson (1,763 rpm) had the highest grounder rate of that group. Herrera allowed just four extra-base hits against his two-seamer in nearly 400 pitches. Unsurprisingly, Buerhle and Weaver pull up the rear of the velocity charts here as well. A cutter is something faster than a slider but with more movement than a four-seamer; some pitchers have different names for what are otherwise similar pitches. The cutter is the pitch that made Mariano Rivera a legend, and now Jansen, who uses it almost exclusively, has proven himself a worthy heir to the throne. The next highest is Wade Davis, at 2,540 rpm. It's good to have high spin on a cutter. Richards, again! Buerhle, again! The second slowest was Kyle Lobstein (81.5 mph). The split-finger fastball, so named for the grip used to throw it, is known to "have the bottom drop out" as it nears the plate. Much slower and with less spin than a four-seam fastball, a splitter has more in common with a changeup than anything else. You generally don't want high spin on a splitter, as it's supposed to dive, and Morton allowed a .560 slugging percentage against it. For Pelfrey, it was his highest-percentage ground-ball pitch. Familia didn't even throw a splitter until August. When he did, it wasn't just good, it was absurd. That pink dot in the chart above, all the way out there by itself to the right, nearly 5 mph faster than second-place Arquimedes Caminero's 89.8 mph? That's Familia. It may be the most unexpectedly dominant pitch in baseball. Changeups are low spin and low speed, generally being thrown 6 to 10 mph slower than the fastball. (Unless you're Scott Kazmir, in which case it's 15 mph slower.) A good one will look like a fastball out of the pitcher's hand, but arrive at the plate slightly slower and lower. That's due not only to lower speed, but lower spin. As noted above, some of these pitch types can overlap one another, so it can be a matter of semantics as far as what a pitcher calls the pitch. Eovaldi's pitch is sometimes called a splitter and sometimes a change, but he made an interesting move to add spin with a different grip, even though more spin on a changeup isn't really ideal. Despite that, Hudson's change was his most effective pitch in 2015. The next highest velocity changeups belong to Lance McCullers and Jake Arrieta, both at 89.4 mph. Morin has nearly a 12-mph difference between his fastball and changeup, and his change was easily his best pitch. A slider is thrown harder than a curveball, but with less spin and movement; conversely, it's not as fast as a fastball, but has more movement. As you can see in the image, sliders have one of the widest groupings of different types of speed and spin. Some pitchers, like Arrieta, have different versions of the pitch. Unlike fastballs, which have easily identifiable spin, sliders can appear with all sorts of spin rates and speed. Here again is Arrieta, in second place at 90.4 mph; the second slowest is timeless lefty Randy Choate at 74.7 mph. Venditte throws slow but his 2,532 rpm is the third highest, showing the relative lack of relationship between velocity and spin. Curves are thrown slowly, generally between 72 mph and 85 mph, and with lots of spin -- when done correctly. While fastballs with high spin tend to stay up, curveballs with high spin dive because the rotation out of the pitcher's hand is completely different (it's more back to front than front to back). Here we have Richards again, with the only qualified pitch of any pitcher all season to top 3,000 rpm (he allowed just 10 hits on it). The second-lowest spin belongs to Carlos Martinez at 1,380 rpm, and as you'll see, it's another example of spin not correlating to velocity. If it sounds like we're repeating ourselves, we are: Weaver and Buerhle have the two slowest pitches here. Sometimes known as a "spike curve," a knuckle curve is an odd creation in that curveballs are supposed to spin at high rates and knuckleballs aren't. 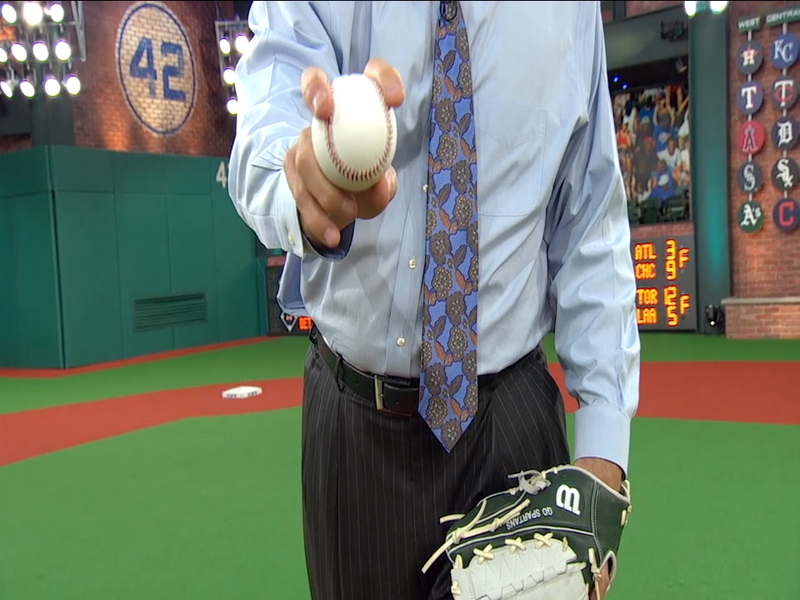 It's often difficult to differentiate between a curve and a knuckle curve, though some pitchers swear by it. It's intended to be similar to a curve, but with less predictable movement. Melancon and Capps both throw the knuckle curve as one of only two pitches, and both had very good seasons. They just do so very differently -- the spin gap here is responsible for the nearly eight-inch difference in vertical movement. The next fastest after Kimbrel are Cody Allen (86.3 mph) and Wade Davis (84.7 mph), which is to say if you can throw a pitch with movement and speed, it's difficult to hit.